Welcome to Today@WKU, the daily newsletter from WKU Public Affairs, for October 22, 2018. Committees of WKU Board of Regents to meet Oct. 26: Committees of the WKU Board of Regents will meet Friday (Oct. 26) in the Martin Regents Room of Jody Richards Hall. Meetings begin at 8 a.m. with the Academic Affairs Committee, followed by the Executive, Finance and Budget and Student Affairs Committees. View from the Hill: Stickwork exhibit gives volunteers hands-on experience: Mother Nature is the star of the show in the latest construction on WKU’s campus. WKU's Amy Bingham has details of an environmental sculpture that has taken shape in front of the Kentucky Museum in the View from the Hill. Campus Sustainability Day events Oct. 24: Join the Sustainability Champions and the students of Geography 489 (Alternatives in Sustainability) in celebrating Campus Sustainability Day on Wednesday (Oct. 24). Premiere screening of KET's Robert Penn Warren documentary tonight at WKU: A free screening of the KET production Robert Penn Warren: A Vision will be held at 6 CT tonight (Oct. 22) at WKU's Van Meter Hall. Women’s golf: Joiner Finds Top-15 Finish Again at Louisville Cardinal Cup: WKU's Mary Joiner earned her fourth top-15 finish in as many tries this season Sunday, leading the Lady Topper Golf team at Louisville's Cardinal Cup. Joiner tied for 15th with a 223 (73-76-74) total at the par-72, 6,303-yard UofL Golf Club. So far this season, the junior has two victories, an 11th-place finish and this week's 15th-place performance. Men’s golf: Hilltoppers Set to Wrap Fall Season at Pinetree Intercollegiate: WKU Hilltopper Golf heads into its final event of the fall season this week at Kennesaw State's Pinetree Intercollegiate looking to seize some momentum. WKU is one of 11 teams competing at the par-72, 7,108-yard Pinetree Country Club in Kennesaw, Ga. Teams will play 36 holes today with the final round slated for Tuesday. Football: Monarchs Defeat Hilltoppers on Game's Final Play: Nick Rice kicked a 26-yard field goal with no time left on the clock to give Old Dominion an improbable 37-34 win over WKU. 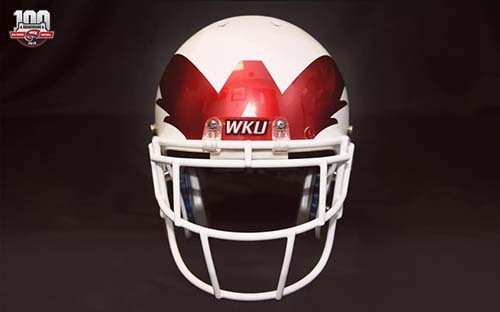 Next: WKU vs. FIU at 6:30 p.m. Saturday. Soccer: WKU Falls 2-1 in Overtime at UAB: Sarah Gorham's strike in the 20th minute erased an early deficit for the Lady Toppers, but WKU could not overcome UAB's overtime golden goal on Friday evening at BBVA Compass Field, falling 2-1 in the C-USA clash. Next: WKU vs. Marshall at 6 p.m. Friday. Volleyball: WKU Falls in C-USA Championship Rematch, 3-0: In a rematch of the 2017 Conference USA Championship, WKU Volleyball fell to North Texas by a line of 25-16, 25-22, 25-23. With the loss, the Hilltoppers now go to 14-9 overall and 5-3 in Conference USA action. Next: WKU at UTEP at 6 p.m. Friday. WKU To Screen Robert Penn Warren Documentary: A new Kentucky Educational Television documentary is centering on the life and career of famed local writer and poet, Robert Penn Warren. 5 p.m.: Artist and Collector Forum, featuring Charles Brindley and a panel of collectors. Kentucky Museum’s Kentucky Room. Part of Salient Features exhibit. Free admission. Contact Kentucky Museum, (270) 745-2592. 6 p.m.: KET Documentary Screening: Robert Penn Warren: A Vision. Van Meter Hall. Free admission, but reservations required. Contact Campus and Community Events, (270) 745-2497. 4 p.m.: Entrepreneurship Speaker Series: Entrepreneurship Everywhere: Being Entrepreneurial in Multiple Settings by Dr. Jack Britt, founder and vice president of Earthcast Technologies. Grise Hall, room 238. Contact Center for Entrepreneurship and Innovation, (270) 745-4142. 5:30 p.m.: Warren County Domestic Violence Vigil. First Christian Church, 1106 State St. Part of Domestic Violence Awareness Month. Contact Elizabeth Madariaga, (270) 745-3159. 6:15 p.m.: State Legislative Candidate Forum and Debate. Downing Student Union Auditorium. Contact Political Science, (270) 745-4559. 6:30 p.m.: Presentation: Democracy and the Informed Citizen. Jody Richards Hall Auditorium. Contact Jonathan Jeffrey, (270) 745-5265. 7:30 p.m.: Concert: WKU Percussion Ensemble. Ivan Wilson Fine Arts Center Recital Hall. Admission is $4. Contact Music, (270) 745-3751. 11:30 a.m.: Genderations Luncheon Series: Dr. Dana Cuomo and Tori Henninger. Faculty House. Contact Gender & Women’s Studies, (270) 745-6477. Noon: College to Career Fair. Downing Student Union, third floor. Contact Advising and Career Development Center, (270) 745-3095.